FWT Founder & Director – Mr. Yatin Tambe – won the prestigious “Exemplary Industrialist Award” from Anna Talwalkar Memorial Trust. He was felicitated by the Deputy Editor of Loksatta, Mr. Mukund Sangoram. We won yet another feather in our hat as our innovative work was recognized with Emerging Enterprises of India award by INDIA’S SMALL GIANT. It was a humbling experience to receive the prestigious award on the birth anniversary of Sir J.R.D. Tata, and the 25th Entrepreneur’s Day of the forum. It was proud moment for FWT to receive one of the most prestigious industrial merit awards – The MCCIA G S Parkhe Award for 2016. 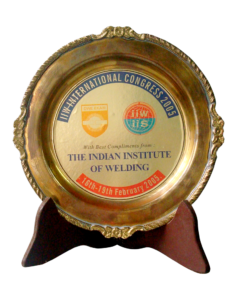 FWT received this award for Breaking conventions in friction welding through process innovation & optimisation. FWT was awarded as one of the top 100 SMEs in India by INDIA SME TOP 100 FORUM for Innovations and Inventions. VENDOR MEET GABRIEL INDIA LTD. It was a great to be recognized by our vendors – Gabriel India Ltd. – for the quality of components we have been supplying them. We continue to innovate, develop, deliver, and support the team at Gabriel till date.